Yesterday, in a single day, there were 19 earthquakes in Fairview according to the USGS. The larger ones were 3.7, 4.0, 4.7, and 4.8. Yet the injection wells in this area last night were going full-bore with lines of trucks waiting to unload more fluids at the injection wells at the same time that the earth was trembling beneath their feet. There have been another eleven so far today. We get news warnings about the impending “big one”, and advice from experts and scientists about how the home owner can mitigate their damage. How damned stupid is that? 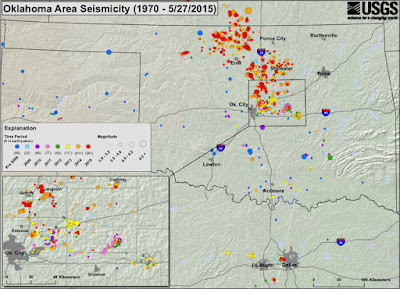 Why concentrate on how to mitigate damage and totally ignore the cause of the earthquakes? Why are we not hearing anything about what the state is doing to prevent the quakes, namely shutting down the injection wells and fracking so as to prevent the big one, rather than advice about securing TV’s and bookcases. Wells in affluent neighborhoods around Edmund have been ordered to stop injection, while wells operated around Fairview are being told that the same measures are a ‘suggestion’, which they openly state they fully intend to ignore. France and Bulgaria have outlawed fracking because of the risks. Pennsylvania has stopped fracking statewide because of the hazards. Florida has already unanimously passed a ban on fracking in one house of their legislature and anticipate its passage. Michigan passed a liability presumption law that holds any company or person injecting a single, repeat, single, hazardous chemical near public water liable for all damages. In the last five years, over 100 bills have been introduced in 19 states dealing with hazards posed by fracking and injection. 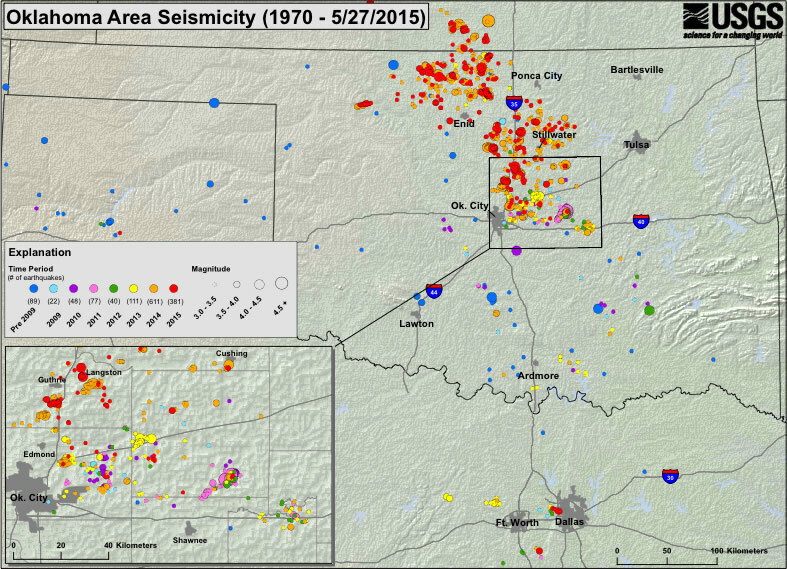 What progress have we made in Oklahoma to deal with potential threats to public health or earthquake causation or promotion? Are we really so bound and intimidated by oil and gas companies and lobbyists that all of our legislators, the governor, and regulatory agencies are willing to follow blindly into disaster and widespread financial loss just to appease oil and gas companies? Yes, I know drilling interests say earthquakes are not related to fracking and injection, and their spin machines rave about how devoted they are to environmental protections, and we are in the position we find ourselves because too many uninformed people blindly and unquestioning swallow whatever they dish out. The media just parrots what they say word for word. We are in the position we are in because financial interests have been allowed to operate in the shadows with no challenges to what they say.